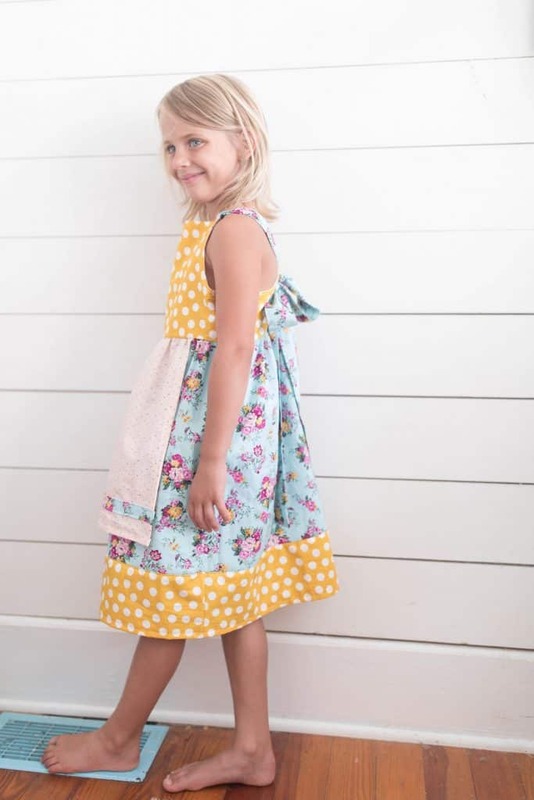 This easy girls dress sewing tutorial includes written and video instructions. It has all the measurements for making this, for any size from 2T to a girls 10. 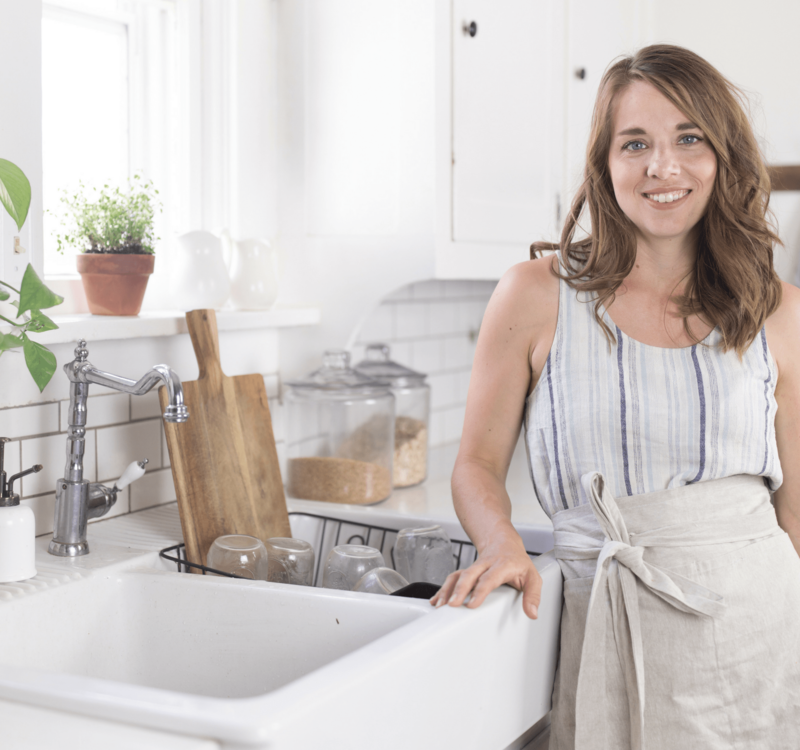 This dress is simple to make, even for beginners. It looks cute in the original length and also a little shorter with leggings, as your daughter grows. I have one I made for my daughter when she was 5 that she still wears now at age seven. I’ve included precise cutting instructions for size 2T, 3T, 4T, 5T, 6, 7 and 8/10. Its even fun to make this dress coordinating for sisters. 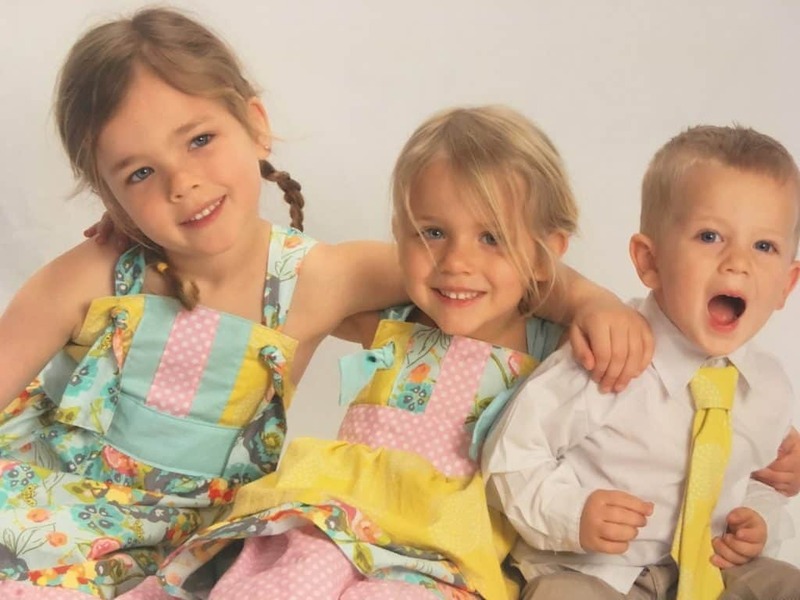 When my girls were little I would pick out three or four fabrics, and then mix them up to make the girls dresses coordinating, but not an exact match. One girl would have the pink fabric in the straps and the other in the bodice, or with the patterns mixed up in some other way. They don’t really appreciate matching so much anymore. My love of sewing dates way back to when I was a kid making little pin cushions for my grandma, with scrap fabric. In high school I wore skirts made from old blue jeans, with the names of my favorite bands stitched in the waist band. I remember designing outfits in my head, when I was supposed to be paying attention to history lectures. Point is. Sewing and designing has interested me for a long time. But nothing could prepare me for the intense sewing obsession that comes with having a baby girl. The only thing that can fuel the sewing fire more than having one baby girl is having 2. in a row. in less than 2 years. It started with some basic Oliver + S patterns that my mom helped me work through. Up until this point, I had only ever sewed little items that I just made up. No patterns or anything official. Once I understood basic dress construction…Make a top, make a skirt, add some straps and make sure there is some kind of way to get into it ie. buttons, elastic, stretchy fabric, etc. All I wanted was to just lock myself in my sewing room and do some serious making. I wanted more. I wanted ruffles, and patterns and COLOR. So much color. Most of all, I just wanted the freedom to play around with fabric and make something with my own creativity. There are so many possibilities! For a while I was making so many dresses, that I actually opened an Etsy shop to sell off some of them. Little girls only need so many dresses in their closets. It was a fun place to really play around with different fabrics and designs. I added ruffles, pleats, fabric rosettes, eyelet, buttons and shirring. A couple of the dresses were made from old curtain fabric. I didn’t really know what I was doing but I was having an absolute blast. Clearly photography was not yet an interest I was pursuing. Bwahaha. To me sewing is just so much fun when you break all the rules and just make stuff. I used dresses the girls already had to figure out what length and width they should be. Other than that, I just let my imagination run wild. Over the years my skills have improved with a lot of trial and error, and the end results are a little more polished. 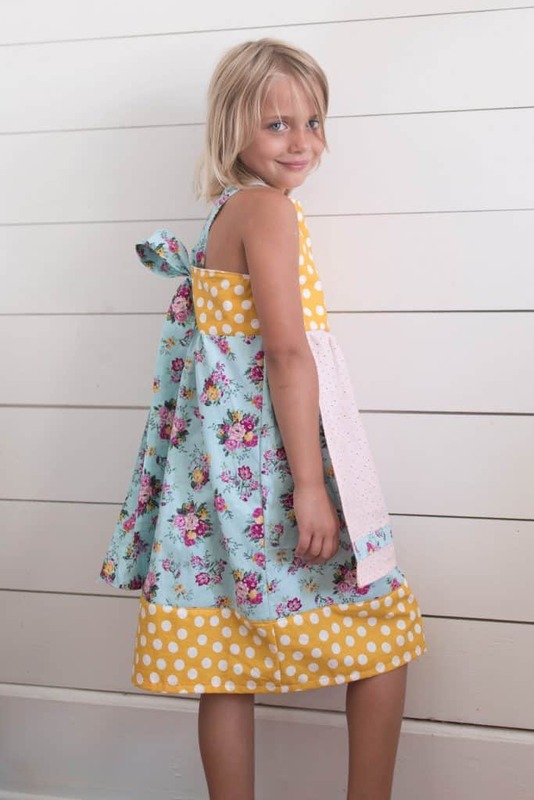 The point of all this walking down memory lane, to when my almost 10 year old was 2 (insert crying emoji), is to just encourage you that sewing is FUN. There are no rules to follow, and no need to stick to rigid patterns. Add that extra ruffle. Pair stripes and polka dots. Use unconventional fabrics, like table cloths and sheets. It doesn’t have to be perfect to be beautiful. 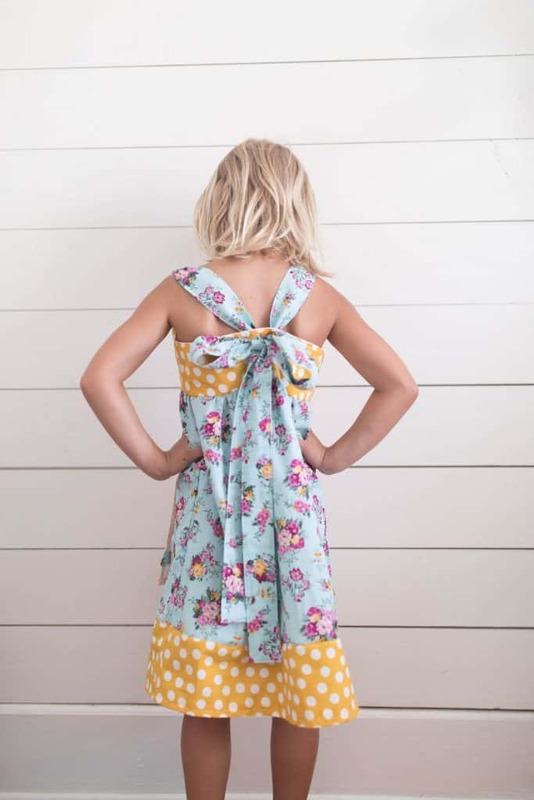 Today I’m going to show you how I make one of my favorite dress styles for girls, that I call “Bow in the Back Dress”. It is perfect for summer with flip flops, or worn over a long sleeve shirt and leggings for the fall. My girls wear dresses like this year round. I have included all the measurements from my experience making this for every size from 2T to 10. 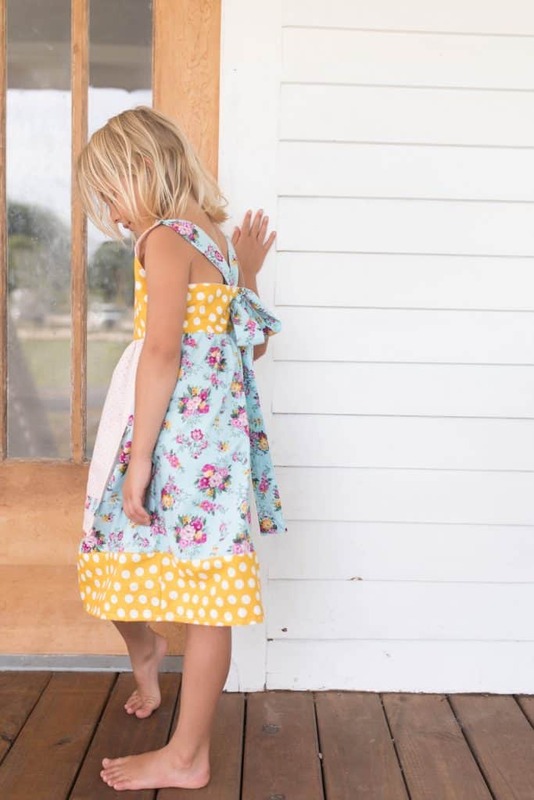 The best fabric choices for this dress are quilter’s cotton, linen and corduroy. Don’t use anything stretchy, like a knit for this project. The finished dress length from top of front bodice to hemline should be 16″ long. The finished dress length from top of front bodice to hemline should be 18″ long. The finished dress length from top of front bodice to hemline should be 20″ long. The finished dress length from top of front bodice to hemline should be 22″ long. The finished dress length from top of front bodice to hemline should be 24″ long. The finished dress length from top of front bodice to hemline should be 26″ long. The finished dress length from top of front bodice to hemline should be 28″ long. Cut all the pieces from the cut list. Also, cut out any of the optional add ons if you want to add them. On one short end of a strap piece, press over ½” toward the “wrong side” of the fabric. Fold the strap piece in half all the way down the long side, right sides together, and sew a ¼” seam. Leave the two ends open at this point, including the short end that’s folded over. Using a large safety pin at one corner, turn the strap right side out. Topstitch all along the two long sides and the folded short side, with a very narrow seam. Repeat with the other strap piece. Prepare the bodice and add the straps. 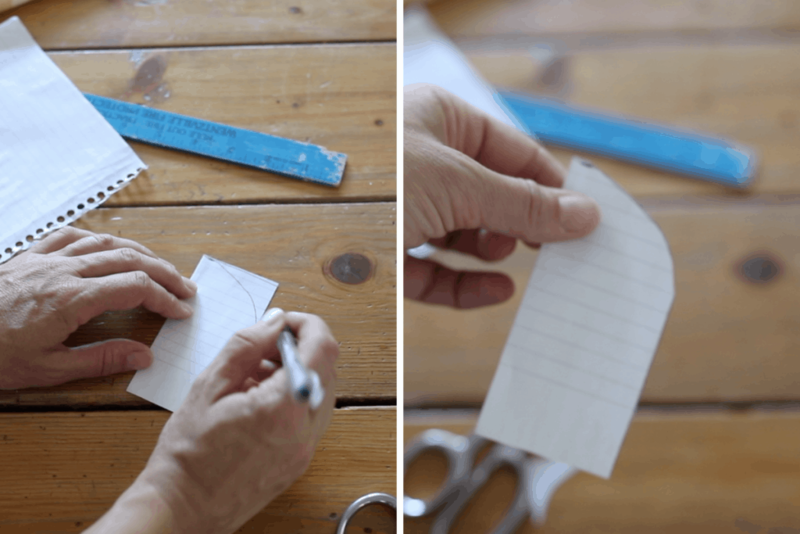 With a small piece of paper or scrap fabric, but a rectangle 2″ by 4″. Now draw curved line to round off one edge of the piece. (Refer to the photo below.) This will be your pattern piece to create arm hole areas on the bodice. Fold one bodice piece in half with right sides together. Line up your little patter piece with the outside and top edges of the bodice. Cut around the pattern piece. With right sides together sew the main bodice piece to the main back band piece, at the side seams. Place the sewn main fabric bodice piece inside the sewn lining fabric bodice piece, with right sides together. Place the un-sewn strap at one edge of the top part of the bodice, in between the two layers and pin in place. Sew around the neckline, arm pieces and back, leaving the bottom open. Make sure to catch the ends of the straps while you’re sewing. Turn the bodice right side out, press and topstitch. 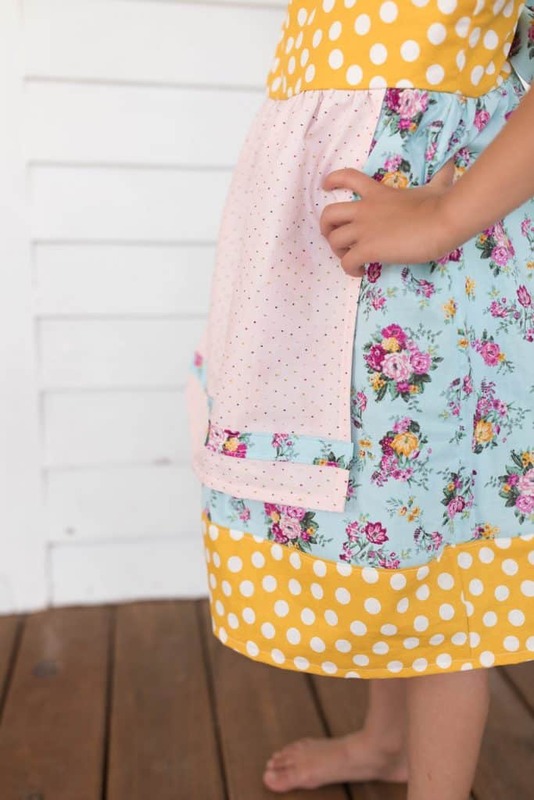 If you decided to make the apron, you need to sew it before attaching the skirt. First, add the strip across the bottom of the apron, if desired. To do this fold the top over to the wrong side of the fabric 1/2″ and press. Repeat with the bottom of the fabric strip. Sew it to the apron approximately 5″ from the bottom. Hem 3 edges of the apron by folding the raw edge under 1/2″ and then another 1/2″ Press in place and sew with a 3/8″ seam. Add the apron to the skirt. (optional) Fold one of the skirt pieces in half to find the middle, and mark it with a pin. Fold the apron piece in half to find the middle, and mark it with a pin. Line up the two pins and sew the apron to the skirt piece, with the right side of the apron piece facing out, and the wrong side facing the right side of the skirt piece. (This is one of the very few times in sewing where you’re not sewing right sides together!) Make sure the apron is centered. With right sides together, sew the two skirt pieces together at the side seams. Pull the gather strings until the size of the skirt piece matches the bottom of the bodice. Pin the skirt to the bodice with right sides together, and sew in place with a 3/8″ seam. (optional) If you have decided to add a bottom band for a little extra color and pattern (this could also be a ruffle!) sew the two pieces together with right sides together at the side seams. Lie the top of the band piece up with the bottom of skirt, making sur to match the side seams. Sew it in place with a 3/8″ seam. Hem the skirt. Press the bottom of the skirt over 1/2″ and then another 1/2″ toward the inside of the skirt. Sew all the way around with a 3/8″ seam. Refer to my video to learn how to use a button hole foot to make buttons. I promise this sounds way scarier than it actually is! Try it on your girl and enjoy! I taught myself to sew when I had my first daughter (also at 23) and I went a little crazy too – especially after having another daughter and the matching ?! 5 kids later I still love sewing. Creating is a near spiritual experience and makes me feel the most fulfilled. Love your blog. LOVE LOVE You make me miss sewing. 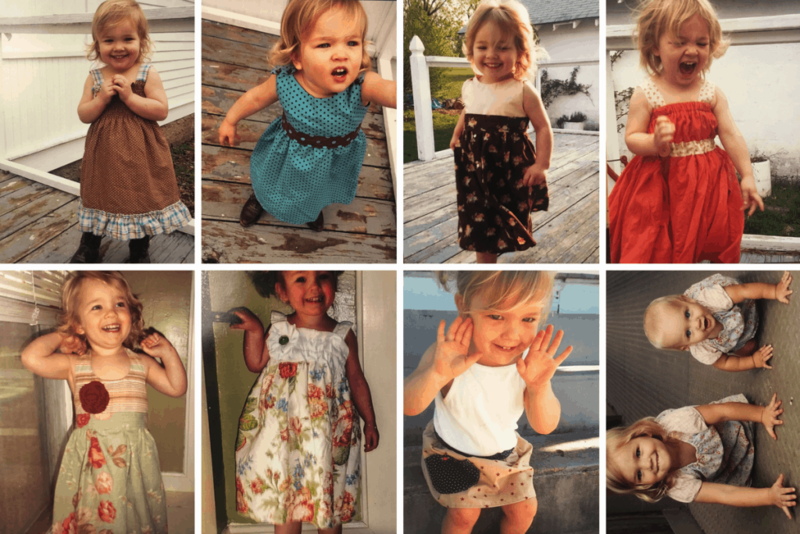 I used to make all the dresses for my twin girls (still have most of them). They are now 28 LOL Waiting on a someday grandbaby. Thanks for sharing. You’re so sweet and talented! Aww wow! I don’t like getting rid of the handmade dresses either. I usually pass them down to my niece and then my sister stores them in her basement! Haha. 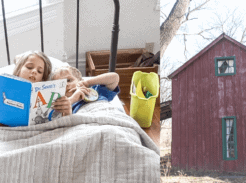 If these are all from when you knew nothing but pin cushions … you are one talented lady! 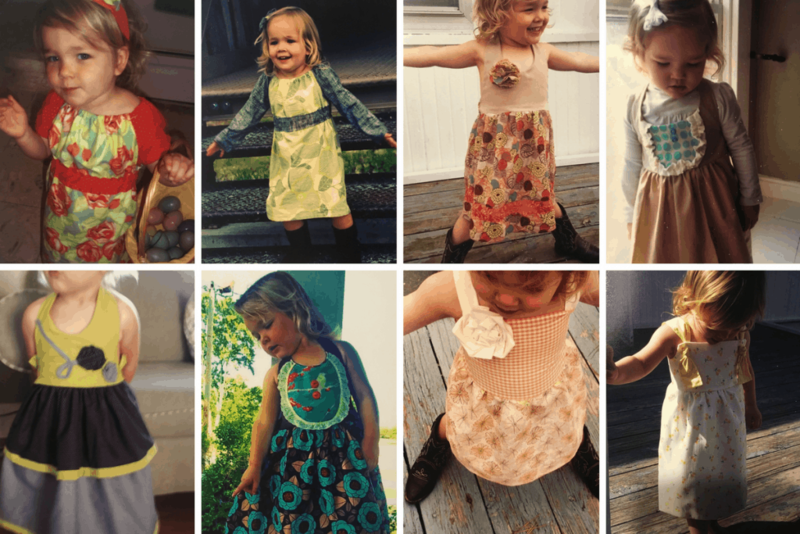 Cute, cute, cute dresses … all! Even cuter kiddos! I sewed a lot when the girls were small … had to stop later as back troubles caused me pain when working at my sewing machine. 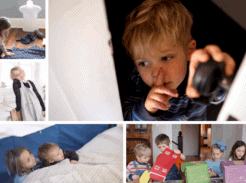 I agree that it nourishes your creativity, so I was lucky to be able to find other outlets! Thank you so much for the amazing tutorial! 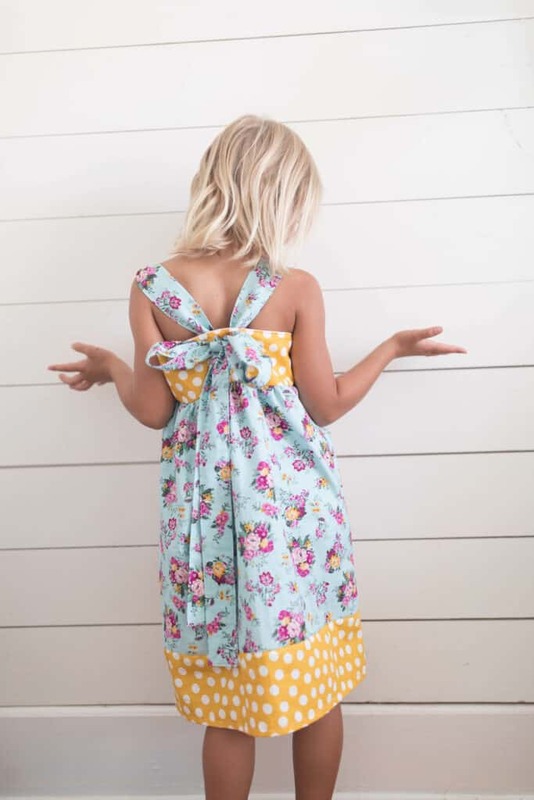 I haven’t sewed in years, but was able to sew my daughter the bow-back dress! She loves it and I’m excited to get started on a second dress! Thank you!